30 dB to 60 dB of variable gain with optimized fixed threshold ensures no false pulses out at any gain allowing optimum detector settings. There is no need to compromise detector noise or gain or speed with other fixed gain amplifiers, and there is never any need for a noisy input linear amplifier to see even the smallest single photon signal. 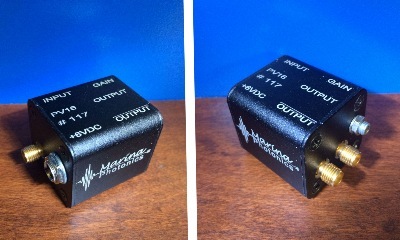 High input gain allows pulse shaping input to minimize ringing and optimize timing. (2) The input is limited at +/-5V to prevent damage to the input amplifier, but +/-0.5V is maximum for which the input is not over driven. The PV16 can easily extract GHz single photon events at 350V acceleration on the Hamamatsu Hybrid R10467U-40 with -8000 Bias illustrating the extreme noise free sensitivity. .
$250 - P2TTL Nanosecond output complementary TTL edge triggered one-shot with preset pulse width.